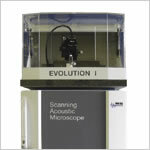 The AM 300 is a simple to use scanning acoustic microscope for advanced industry quality control and research. It is a cost-effective tool enabling non destructive acoustic investigations using new rf and transducer technologies of up to 400 MHz. Built around a core platform that utilizes the latest production and research technology, the AM 300 can accurately handle samples through a precision alignment subsystem. It has an ultrasound frequency range up to 500 MHz, with transducers from 3 MHz - 250MHz. Scan range: x; y = 300 mm, z = 100mm.